Peter Hart provides this new look at the crucial period known as the “Hundred Days,” roughly from August to November 1918, when the Allies began the final series of offenses across the entire Western Front that ended years of stalemated trench warfare and restored mobility to the battlefield, allowing the Allies to bring a preponderance of men and material to begin pushing the Imperial German Army out of France and Belgium. His background as the Oral Historian at the Imperial War Museum comes through in the format of the book, not a traditional battlefield chronology detailing the movement of divisions and regiments, but a more general narrative interspersed with personal accounts from soldiers and airmen of both sides, offering a fascinating glimpse at the bravery, cowardice, fear, rage, and general mayhem the combatants felt as the entire nature of the war changed in a short period of time. Expertly interweaving these recollections, Hart covers the Allies’ first steps in learning modern combined arms warfare, integrating infantry, artillery, tanks, and aircraft to apply persistent pressure all along the front, never giving the Germans time to react by shifting forces to meet each sector offensive, or to properly reinforce their units as a series of loosely coordinated Allied attacks doggedly ground down the Germans. Beyond the tales of combat action, the book also looks at the human side of war as the soldiers encounter civilians trapped in occupied territory, and the first hint of what became known as the Spanish influenza begins to strike soldiers and civilians of all sides, rapidly becoming a global pandemic that kills more people than the war itself. The roots of the myth that the German Army was “stabbed in the back” that would be exploited by militarists and fascists during the long rise of Hitler and Nazism can definitely be seen in the political machinations of the German General Staff to suppress the truth of the battlefield collapse of the army and force a weak post-Imperial civilian government to sue for peace. 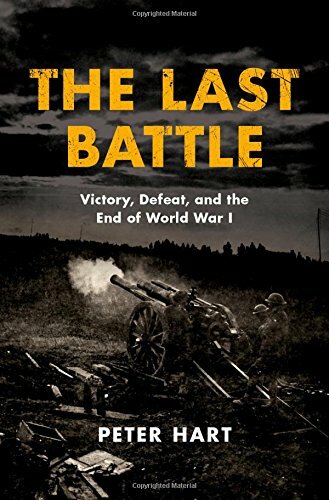 Finally, the book offers a fascinating glimpse at the ending of the war and its immediate aftermath, or as the author terms it, the period of the war that traditional histories speed through after recounting the long and exhausting years of ineffective slaughter between trench lines. This was certainly the most challenging time of the war for soldiers on both sides as rumors of an Armistice and the potential of being the last soldier killed in action begin to affect the morale of all the armies. The author concludes the story by delving into the post-Armistice era as the Allies struggle to occupy sufficient German territory to force the final negotiation of the Versailles Peace Treaty, demobilize millions of soldiers, and begin the reckoning of the carnage and destruction of what would be called, until 1939, The Great War. Well written, with an exceptional collection of personal narratives, this book provides a fascinating look at the last four months of World War I.